You must be prepared before going into Igwebuike forest in Awarra, Ohaji/Egbema Local Government Area of Imo State, one of the chief priests in the area, Mr. Okoro Ogbuji, toldSouth-East Voice. 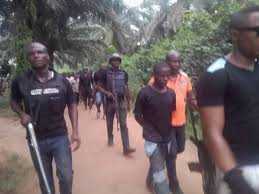 Sometime ago, it was the story of a 63-year-old woman, one Mrs. Ogo Omeriji, said to have been kidnapped, murdered and buried in the said Igwebuike forest. This was after the suspected kidnappers allegedly collected N500,000, as ransom. The ugly incident took place in December, 2015. 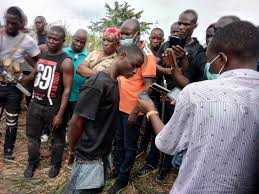 About a year later, it was another tragic event, in which one Stanley Eluwa Ihechika, aged 24, a motorcyclist, was lured into the Igwebuike forest by suspected cult members, killed and buried in a shallow grave. His remains were exhumed in October, 2017. 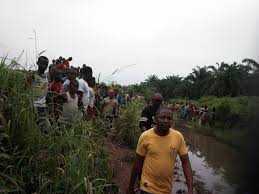 Omeriji died in the hands of those suspected to be her nephews, a three-man kidnap syndicate, while Eluwa was killed by a suspected five-man gang, in which an 18-year-old boy, Bobo John, had been arrested by the Imo Police Command who led the Police team to Igwebuike forest, where they exhumed the carcass. The forest is known by some villagers as a hideout for criminals, secret cult members and where unreported atrocities had been committed. A dangerous forest, only the brave, they say, can attempt to cross but not without expecting possible attacks. For some people, at about 06:30pm, villagers who have one thing or the other to do within the Igwebuike forest, would have to suspend their engagements for a safer time, for security reasons. One of their reasons was that at night, they usually hear sounds of gunshots coming from the Igwebuike forest. Most worrisome was that the agrarian settlement, perhaps has been turned into a war zone by rival cult groups; a situation, which may have discouraged farmers from producing foods. Ohaji/Egbema Local Government Area is known for cultivation of cassava and production of garri. It is said to be at the top in garri production, among the 27 local government areas in Imo State. In fact, some describe Ohaji /Egbema as the food basket of Imo State. Another worrying dimension as explained by some of the villagers, was that the cult groups measure their strength by the number of their opponents killed and buried in the Igwebuike forest. Many were of the opinion that some young people who had gone missing without trace, may have disappeared into the Igwebuike forest. The story pointed out that, members of these cult groups would escape whenever they sensed any threats to their lives. As a result of that, anyone left at home on the fateful day would bear the brunt. “These boys are sadists, their utmost joy is to see the heads of their fellow human beings severed and their skulls used for drinking, only they can tell what type of drink,”one of the villagers who did not want his name mentioned toldSouth-East Voice. Mr. Ogbuji, the chief priest told South east Voice that because some elders in the community were against their activities, some of them were being haunted for saying the truth. He said, “I am from same family with Stanley Eluwa who was murdered. I could remember that I had a problem with this secret cult members. It started when I paid them a visit and asked them questions on why they should kill their brothers and sisters in the name of cultism. “I asked them why they would pursue us out of the village, something which we did not do to our forefathers; something we did not do as young people? Do you know that after advising them to stop the killings, the different cult groups started planning to kill me. They made several attempts but they did not succeed. The commissioner said: “The peace and tranquility we have witnessed in the past two months can only be attributed to the high profile arrests and recoveries the command has made within the period under review.